Window Treatments > Ready-made Curtains & Drapes : Shop by size, color, fabric, style & lining options > Ready-made Curtains & Drapes by Header Style: Most Sewn in USA! 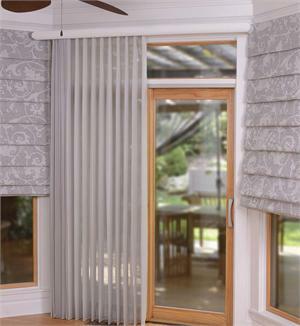 > Rod Pocket Curtains > Popular Window Treatments Products > Fabric Wrapped Vertical Blinds! Fabric Wrapped Vertical Blinds - MADE IN THE U.S.A.
Take a step beyond the boring, traditional vertical blinds of the 70's. The luxury version incorporates modern track systems and a stylish fabric to accent each individual vane. Each vane is 3-1/2 inches wide with rounded corners are are available in 3 colors: white, ivory or alabaster. Heavy-duty vertical track system capable of rotating and traversing at widths up to 240" for residential and commercial applications. Finally a stylish alternative to traditional verical blind systems. A stylish fabric covers each vane. -Workroom will take 38" deduction for width/length to allow for clearance. i.e. a 1-way draw will have one false vane & a split draw will have 2 false vanes. False vanes will not turn with the true vanesthis helps eliminate any light gap. If you choose not to have a false vane(s), please indicate on your order. openingdepending on the width of the treatmentto allow for stack-back. Provide Length from the top of the headrail, to the bottom of the Eurohem. the illusion of taller ceilings and bigger windows. -Workroom will NOT make any deductions. You choose your fabric and let us create your window treatments. Simply call us for a quote! 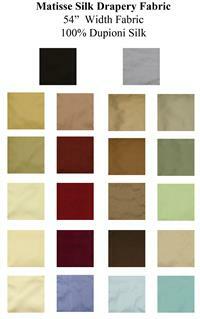 We also have a complete selection of curtain rods for your window treatments.